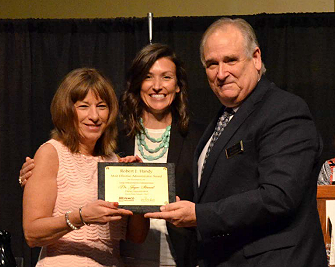 Congratulations to Dr. Joyce Stewart, as she was honored with the Robert J. Handy Most Effective Administrator Award, sponsored by PEMCO Insurance and WASA. A peer committee selects the recipients from nominations that describe how each nominee is taking part in realizing the nine characteristics of high performing schools/districts as defined by research from the Office of Superintendent of Public Instruction. Established in 2002, these awards recognize outstanding Washington public school administrators. Dr. Joyce Stewart was selected as a highly effective superintendent for large districts (over 2,000 students). Public Schools for students who may not be able to afford one. See all winners on the PEMCO/WASA Robert J. Handy Most Effective Administrator Awards web site. The Washington Association of School Administrators (http://www.wasa-oly.org) is committed to the development of quality education through professional leadership. Members benefit from a supportive community of professional leaders working to provide insightful and valuable training, support, and resources to education leaders, and to sustain a positive impact on legislative and community leaders. With over 1,675 members, membership is open to all education administrators in the central office, building management, and educational agency positions. A not-for-profit organization, WASA is funded by membership dues and association events.